WOW am I in trouble. I was trying to hook the truck up to the trailer hitch and somehow the ball got behind the latch. When it pulled forward, the locking mechanism jammed forward. Now the whole thing is stuck (jammed). I pulled a couple of bolts out to see if I could un-jam the meconisim, but now it is jammed and missing parts. I called our Malubu dealer, but he can't come fix it on site, I have to get it there for repair. How am I supposed to do that. What am I going to do? Any suggestions? WOW am I in trouble.... What am I going to do? Any suggestions? Man, It's not often that I'm at a loss for words. If you can't get it unjammed and reassembled, the only thing that I can think of is finding a tow service that has a tilting flatbed truck to load the whole thing onto. Try calling these guys - Waymire - they sell trailer parts and might have a suggestion. 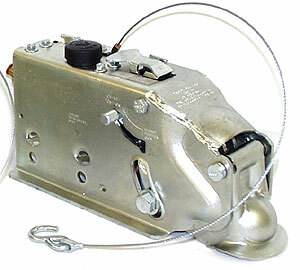 You might also call the trailer company or whoever made your coupler. Plead with your dealer to make the trip. Find a tow company with a roll-back to come pick the whole thing up. There has got to be a way to disassemble it. Did you look on the underside for bolts of something that would release the surge part? You may have to take the brake lines off to get it to come out. Yes I have taken apart everything that can be taken apart. The only pin left as you can see in the picture is the one that needs to be removed IMO, but it is not a bolt, it is a rivet. That may ultimately be what needs done, but I am not ready to start into that with a hack saw just yet. I would like someone a little more knowledgeable to look at it first. To bad that isn't a swing away tounge. Looking at it again, the slot on the side looks like that is where a bolt goes through to control the amount of movement for the surge brakes. In order to change the master cyl. you would have to remove it (the MC) from the front. My observation. If that is so, then the front piece must pivot on that rivet. Kind of poetic. That piece may just be stuck or jammed. The MC should have some kind of rod that pushes the MC piston. That may be keeping the front from coming apart also. I am just speculating. Call the trailer mfg., they should be able to give you some guidance before paying to tow it. That piece may just be stuck or jammed. The MC should have some kind of rod that pushes the MC piston. That may be keeping the front from coming apart also. The MC has been disconnected as well as the surge brakes. The only thing still connected is the hood and the tung under the hood. The are jammed together and the pin holding them together is a rivet, not a bolt and cannot be removed, only cut off. Can you post a digital shot from underneath... so we can get a look at what might be jammed? What you need is the proper instrument to deliver the necessary directional force. Good luck, what a PITA. This is a little of topic, but I'll share anyway. It's a carpenters saying. If it doesn't fit get a bigger hammer. Beat to fit, caulk to cover, and paint to match. Good luck with the hitch BTW. I found what looks like yours on-line at eastmarine. At least we know what we have here. The rivet is a bolt in this one. I suspect grade 8. It's hard to see if that is a bolt or rivit from this picture. Mine has the same bolt head on this side, but a smashed out rivit type end on the other side, not pictured here. It looks exactly like mine. Unfortunatly, it is not as simple as buying a new one. Mine is completely welded into the trailer. You said the locking mechanism is jammed forward, ... is there a nut on the under side of the piece that locks against the hitch ball? If so, you could loosen it, hook it on, then tighten it up to get it to the dealer. I wish I could see it in person, I know I could figure it out. You might call that EasternMarine tomorrow and see if they have an "exploded" diagram of the coupler on a .pdf that they could e-mail you or even a hard copy to fax you. At least then you might know what hung up where and possibly how to free it. Just a thought. Did you remove the breakaway pieces? Or is that down in the black hole. If this is the case I would take a 2x4(so your not hitting metal on metal) with the grain against the ball flange or on top of it (being careful in not bending the flange). Try driving the ball recepticle with the biggest hammer/deadblow you have back to it's original position where the bolt hole and the housing hole line up. That rivet or pin with the idents on it is just a piviting point. I dont believe removing it will really help. Monday, I'm sure you could give Atwood a call to get some help and a diagram. My Waymire catalog has an exploded view but it looks like your riveted bolt is a nut/bolt in the exploeded view. Weird. Have you tried using a crowbar for leverage to move the piece back? The inner tongue piece that you have a red arrow pointing to in the pic looks to be the culprit. Have you tried putting a crowbar/prybar into the spot where the ball would go? It looks like maybe that little tongue was jammed up into the coupler and you could possibly just pop it back out with some leverage and the force going back and downwards. The crowbar worked. As is suspected, the hydraulics had nothing to do with it, as I disconnected them by pulling out the first bolt. The tung had hyperextended forward and gone past a small metal flange designed to hold it back. With the crowbar, I as able to push it backward, past the flange and back onto the correct side of the flange again. Thanks for all the help. Now I just need to get all the parts back in their correct positions. Now get that trailer put back together and go get that boat wet.